There are many images that come to mind when I think of adventures in Africa. None of those images are more iconic then a LandRover on safari. The word safari is often correlated with searching out wild animals like lions, rhinos and cheetahs, but in fact safari is the word used for any journey one might take. That is why LandRover is so important to us. As it was the first vehicle ever seen by 60% of all developing country’s nationals due to it’s ability to traverse all type of terrain, it also exists as our family vehicle. As a side note, this vehicle was once owned by a former President of Kenya. 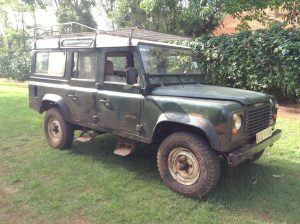 We own a 1990 LandRover Defender 110. This is an all wheel drive vehicle with a central differential lock. Basically meaning it gets us through all the muck and bumps all the time. It seats 12 people legally and many more otherwise. Because of the many years LandRover has been in Kenya, parts are readily available as well as endless modification opportunities allowing us to customize it to our needs. Through a generous donation we were able to purchase it and get a clean title (sometimes a challenge in Kenya). It was neglected for many years by its previous owner and therefor requires elements of restoration. Not a restoration to exact original specifications, but to specs necessary for our family and ministry use. We were able to sell our old vehicle and put some of that toward replacing shocks, bushes, tyrod ends, brake cylinders, brake pads, master cylinder, clutch slave and a few small details. From the picture you can see there is still a lot of work to do. To name a few issues to work on we need seats belts, locking doors, functioning rear windows, new tires, and for maximum efficiency and functionality a 200tdi engine. Considering our present condition and the rough road we often travel as well as the future ministry efforts we are currently pursuing this can become the ideal vehicle for our situation. For more information and opportunities to donate toward helping us recondition this iconic LandRover visit our PRIORITY PROJECTS page.